Clean up your cleaning supplies with Norwex and this awesome deal! I’m not going to lie, it took me wayyyy longer than it should have to make the switch from traditional cleaning products to Norwex. I mean, I loved the idea of healthier and more environmentally friendly cleaning products, but when I could get so many cleaning supplies for free with coupons, it took some real convincing to get me on board. The final nudge to get me to try Norwex came with the pregnancy of my third child. I was beyond exhausted, chasing around a four year old and a 2 year old and just couldn’t keep on top of cleaning (or even clean at all some days). Around this time a friend posted about her kids helping her clean using Norwex and not having to worry about chemicals touching their skin or accidentally being ingested. 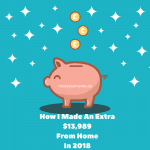 So I gave it a try and within days of my first couple of Envirocloths arriving, I booked a party to stock up on items for free and deeply discounted. Then I joined, to get items for free and deeply discounted all the time! And here’s some great news for you! 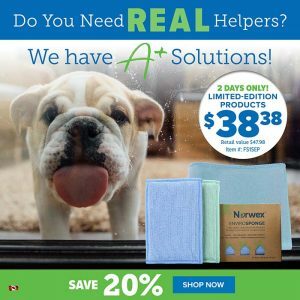 Until Friday September 14th, you can take advantage of the Norwex A+ Solutions Flash Sale and get the limited-edition blue Window Cloth and the limited-edition blue and green EnviroSponges 2-pack for only $38.98 (regularly $47.98). That’s a 20% savings! Next What is the Scanning Code of Practice (SCOP)?